As is very obvious, The Wake of Kerberos is a parody/reinterpretation of Final Fantasy and some of it's conventions. Above all else, I'm trying to tell an interesting story and create a setting that people will like (but not wish to live in). That said, the story is also something of a design doc for a game that I would enjoy playing. So, the rest of this rant will cover some basic gameplay concepts that I would hope make the story make a little more sense (why I included some details and not others) and could be taken into a little game in the future. Let's start with talking about the overworld. I like big, colorful worlds that have a fire location, an ice location, a temple in the sky. I have nothing against the vast and varied worlds of Zelda and Final Fantasy. However, playing Shadow of the Colossus has proven to all of us that a vast, relatively consistent area can be just as enthralling, and the effect is heightened, not undermined as you would expect, by being virtually uninhabited. You can ride for miles without seeing a single living creature. The Kerberos setting is very much like this: the terrain has a great deal of topographical change, but in general the wildlife is very consistent, in that it is almost nonexistant. Kerberos has razed the surface of the planet until there is almost no life left on it, a vast wasteland where even the most resourceful human can't survive. This brings us nicely the second aspect of the setting: NPCs. I would like to play a game where every NPC can be named, have a little backstory and detail, and have few enough of them that you can actually come to care about all of them, or at least remember all of their names. Think Majora's Mask: for the time the game had quite a large cast, but in today's gaming climate it would be fairly small. Either way, lots of people learned the names and backstory of all the characters without difficulty, and that's a gameplay component that I like. It would make the tragedy of the setting so much more powerful if you can actually name people who died in an attack. Battles are done in the environment, which means that holding the high ground means something. There is a semblance of turns, but done in move increments. Or, to say it another way, every move has a warm-up and cool-down time, usually translating into "looking for an opening" followed by "getting clear of the kickback". You can watch one sub-team at a time, and issue instructions only to that team. This is mostly to help keep the interface strealined, but also reinforces the next aspect. Characters are controlled by a simple AI system that the player has limited control over. You can always switch to the team and issue direct commands that will take precedence, but in general you will be trying to write out scripts ahead of time so that your team will fight on their own. Just like a real team, really. Leveling is accomplished by simply winning fights (which will increase the potency of your attacks and the strength of your wards) and also by investing Favors into training sessions that will teach you new moves and junk. Most combat training is very sequential, with the schools teaching it requiring you to complete certain sessions before going on to other sessions (just like real school). Enemies do not drop gil or gold or anything. You do, via Ixion, pick up rewards for killing Prints that are near to populated areas. Large Prints (which are generally further from cities and shrines, due to other combat teams) somethings have valuable materials in them: metals such as titanium have become exceedinly valuable. Each general category of command (Attack, Defend/Evade, Offensive Magic, Defensive Magic, Item) would be represented by an icon floating in a cluster around a central point. The user could twist the cluster around, and then select whichever icon is 'closest' to the screen. The category icons dissapate and the core expands into several items specific to that category, such as different kinds of attacks or various subcategories, such as classes of spells or kinds of items. Repeat the selection process and then choose your target: offensive actions automatically target the previous targeted foe, while curative actions select the nearest ally who needs it the most, but you can always change the target at this point. Why the 'cluster' system you may ask? Well, the cluster would rotate in softened increments appropriate to the number of items. So, if you just have 5 items, each tap of the control stick would rotate the cluster about 90 to 120 degrees, effectively changing your selection in one tap. This way, to select a specific fire spell, it would be right/A/up/A/down/A, as opposed to down/down/A/down/down/A/down/down/A. See the difference? You could, if you were confident, even assign it so that menus with 5 or less items don't need the A button confirmation, making the menu process right/up/down. Pretty easy stuff. 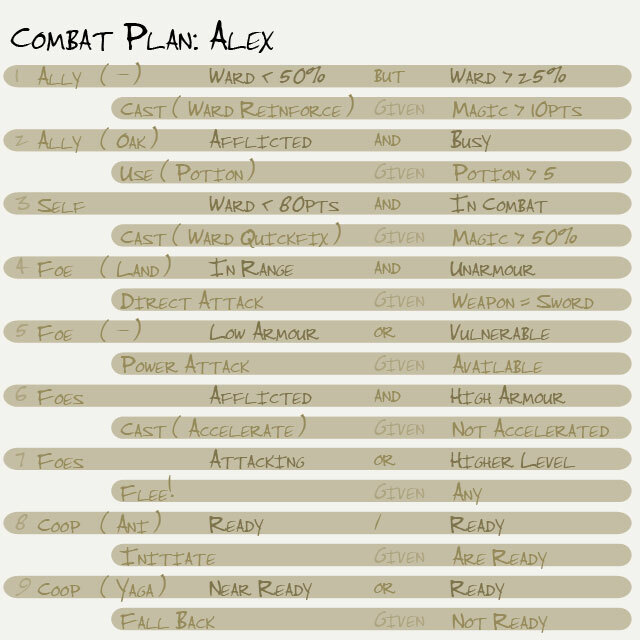 As you can see, Alex's combat plan is pretty complex. Each action is ranked, with 1 being the most important, and working it's way down from there. Because Alex is largely a supporting member, he doesn't have much foe-centric actions planned, while a character like Chase would be almost entirely foe-centric. Each action has a target (foe or ally, which can be further specified) and a condition that has to be fulfilled for the action to initiate. Because this is a late-game mockup, Alex also has secondary conditions, which can be or, and, or but. These secondary conditions help add some specificity to the original conditions (for example, an enemy has to be both within range and unarmoured for it to be worth Alex attacking it. Similarly, if an ally has > 50% ward available, Alex should look at reinforcing them, but only if the ally has more than 25%... it's not worthwhile for Alex to try and help them after that point, Oak is going to have to do it). Note the last two items. These refer to Coop actions, which is where members of two subteams cooperate briefly to achieve a specific result that no one team can ordinarily achieve. For example, Ani and Alex can work together to initiate Overclocked, an attack that allows Ani to move at very high speeds for a little while, inflicting very high damage. This is different from Alex just casting a haste spell on Ani, because the results are much more pronounced but it takes Alex out of commission for a bit and requires Ani to be in the right place at the right time. The last major gameplay item I'm going to talk about today is the Kerberos mechanic itself. Kerberos is an undefeatable force. It's like trying to kill a blue what with a butter knife, it's just not possible. As a result, it is important that you keep a good eye out for where Kerberos is, and take pains to stay out of his way. Every once and a while you'll screw up and get too close, which will initiate a sequence where you have to flee, no matter what you're doing. This can be advantageous though: due escape sequences you will often find other escapees, who will reward you for helping them. Wards: Similar to traditional health systems, wards are defensive reflections of user's spiritual strengths. Prints:	Golems born of blood in Kerberos' footprints. Because they are not being made according to a plan, their makeup varies widely. Favors: A nonphysical monetary system. Ixion is capable of transferring these magically. Kerberos: Gaurddog of Hell. Summoned as a weapon, but was orders of magnitude bigger than expected, so killed the original summoners and has been rampaging ever since.